The Rice MBA for Executives allows you to focus on management, thought leadership, and business strategy – without interrupting your career. Designed for business leaders, the Rice MBA for Executives provides you an opportunity to join an elite group of professional colleagues and capitalize on a rigorous 22-month curriculum, innovative classes, and expert faculty. You’ll share business successes and challenges with a diverse group of classmates who will become colleagues for a lifetime. An MBA for Executives from Rice will accelerate your career through the unsurpassed teaching and classroom experiences you will encounter. You’ll form life-long relationships with colleagues who are C-suite executives: 52% of our students are senior level managers; 40% have advanced degrees in medicine, law, finance, engineering and many other disciplines. The diversity of the program is reflective of the diversity of Houston with 21 countries represented in the student fabric. The Rice MBA for Executives is designed for business leaders that have 10 years of management experience who want to complement their managerial experience and make better executive-level business decisions. 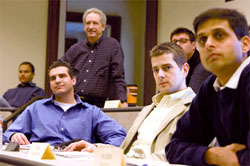 Admission to the Rice MBA for Executives program is a highly selective process. We recruit candidates who have demonstrated a history of superlative academic aptitude, through your 4-year undergraduate degree, GPAs, and test scores. An undergraduate degree from an accredited US institution or international equivalent is essential. If you have completed a 3-year Bachelor of Commerce (BCom) degree, we also require a 2-year Master of Commerce (MCom) degree. Your leadership potential is assessed by your management experience, both on the job and through extracurricular activities. Candidates with at least 10 years of work experience are preferred. Your resume, evaluations from employers and/or professors, and your essay responses should indicate your level of leadership skill. Your personal goals, work experience, and reasons for choosing the Jones School are critical elements of your application, and should illustrate intangible factors, such as: Why are you pursuing an MBA? How have you benefited from your academic, professional and personal opportunities? What qualities will you bring to the Jones School, and what will you seek from us?